If the construction industry estimated projects as poorly as the IT industry does, we would still be living in mud huts. Yet inaccurate project estimates have become the norm in the software industry. Find out how you can turn your estimates into reasonable predictions of project performance. So, you've been asked to take over the leadership of a struggling, disconnected team. Now what? Create a culture where the building of trust between team members is fostered, flourishes, and thrives--where people who have not begun to trust each other can discover the possibility. 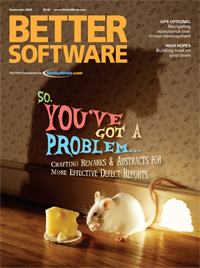 Software defect reports are among the most important deliverables to come out of software testing. They are as important as the test plan and will have more impact on the quality of the product than most other deliverables from the software test team. It's worth the effort to learn how to write an effective defect report that conveys the proper message and simplifies the process for everyone. As programmers, we are not merely engineering drones; we are also artisans. The act of programming involves as much artistry as it does technicality. When we craft great software, we naturally use language idioms help to show the elegance, beauty, and artistry of a piece of code. But sometimes the desire for beautiful idiomatic code can trip us up. Many technology workers are drawn to the industry from seemingly unrelated professions. Don't underestimate the importance of a liberal arts education and general life experiences to the technology field. These workers can bring a lot of value and wisdom to your team.